George W. Kaferly, 98, of Denver, Colorado, passed away on Saturday, February 2, 2019. George was born in Chicago IL on February 2, 1921 to George Leo and Lu Gabel Kaferly. George married Adele Chavez on October 16, 1945, and lived in Chicago until they moved to Denver in 1964. George attained his Associate Degree in Engineering and worked for Western Electric Co./AT&T. During his career, George received the Junior Achievement Award and was a member of Telephone Pioneers of America. 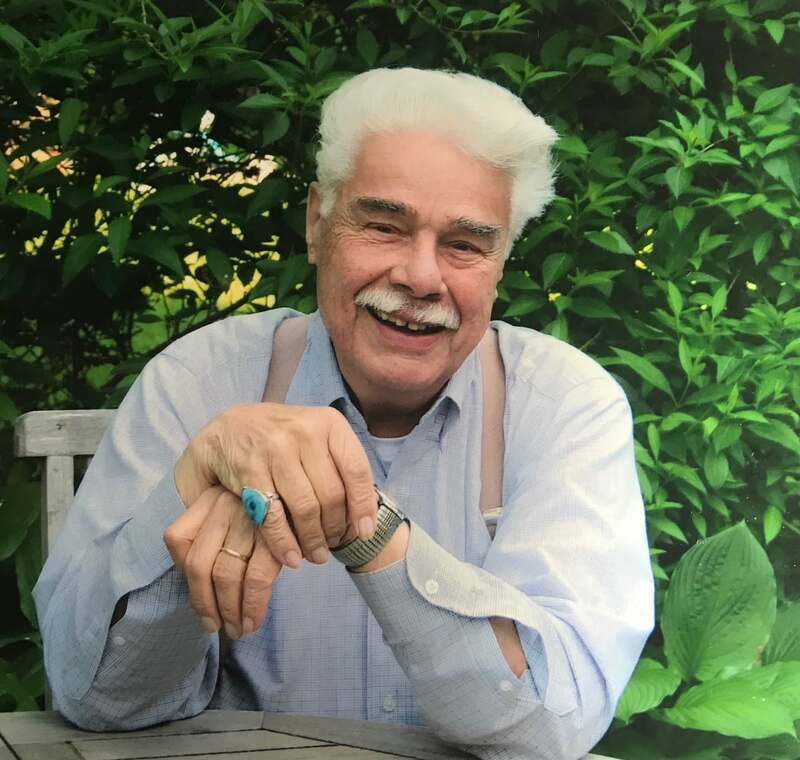 He was a founding member of Church of the Risen Christ Catholic Parish, a celebrated Master of Ceremonies, and was known for his great sense of humor. For many years, he delivered food every Monday to the needy and homeless with his good friend Bill Hammond. After George retired, he and Adele traveled extensively, visiting the U.K., Ireland, Spain, Italy, Prince Edward Island, Nova Scotia, Greece, Germany and Hawaii. George was preceded in death by his wife Adele Chavez Kaferly, his sister Louise “Doll” Kaferly Yunker, and brother James Kaferly. He is survived by his children Barbara Ann (Dale W.) Buckley, Adele Therese (Loren Leys) Kaferly, Diane Helene Kaferly, and Christine Louise Kaferly; his grandchildren Donald George (Kristen Elliott) Jones, Olivia (Christoph Kammel) Kaferly, and Sarah Adele Leys; and his great grandchildren Emma Jones and Sydney Jones. He is further survived by many loving nephews, nieces and dear friends. George was beloved by those who knew him and will be greatly missed. Visitation and Recitation of the Rosary will be held at 5pm on Monday, February 18, 2019 at Horan & McConaty Funeral Home, 11150 E. Dartmouth Ave., Aurora, Colorado. A Funeral Mass will take place at 10am on Tuesday, February 19, 2019 at Church of the Risen Christ Catholic Parish, 3060 S. Monaco Pkwy., Denver, CO, followed by burial at Fort Logan National Cemetery at 1pm. Special thanks to Dr. Tamara Woods & Staff at CHPG Primary Care Southmoor, Diane Martini & Staff at Eastern Star Retirement Community, and Karin L. Johnson and Team at Centura Home Hospice. In lieu of flowers, memorials to Samaritan House Homeless Shelter, 2301 Lawrence St., Denver CO 80205 would be appreciated. The family greatly appreciates donations made to these charities in George William	Kaferly's name. Words cannot describe the impact that George Kaferly quietly made on the world. He left his world a better place from his efforts. My world was shaped by him, far more than by any other man, and as my grandfather he was there for me every day of my life. His laugh, his “hurumphs” and the belly-laughs we shared were enough to always make me feel that everything will be ok. Everything was OK when with George: our summer working weeks at Buckley & Co; sitting on the back patio at the house on Wabash Ct as we watched the thunderstorms roll through the eastern plains; the stories about family that preceded us and the legacy of honorable living that he embodied and worked to pass down. All of that made me who I am, and with his passing leaves an irreplaceable emptiness of which I have yet to grasp the true extent. Without George and Adele, my loving, caring, and happy grandparents, a void is left that I will never be able to fill. My only hope is that I can be as they had been for me: supportive to those around me, caring and fostering for a better future for my children, and I hope to be a person to leave this world a better place just as George and Adele Kaferly have done. George was an amazing man who always added sunshine and joy to any event. It was an honor to know George and Adelle. Their kindness and love to James will always be remembered in my heart. Please accept our sympathies in the passing of George.. Thoughts and Prayers. George was my best friend for over 35 years. He always had a story or a joke to tell. Like the time he, Ed Gietl and I were installing kitchen cabinets at the Sacred Heart House downtown. Sister Delia came out of the restroom. She was wearing jeans and George looked at us and said “how do you tell a nun her fly is open?” We’ve laughed about that story for years along with countless others. I will miss my dear friend, and his phone calls just to tell me a joke or two. May he rest in peace with the love of his life, his “Dell”.